On Sunday, January 20, YIVO will host Yiddish Anarchism: New Scholarship on a Forgotten Tradition, a day-long conference. Claire Ehrlich sat down with scholars Kenyon Zimmer, Anna Elena Torres, and Tony Michels to discuss, among other topics, anarchism’s relationship to Jewish culture, religious practice, and Zionism; its erasure within Jewish scholarship; and why it’s so often dismissed as a political tendency. This conversation has been edited for length and clarity. Claire Ehrlich: The synergies between Jewish history and culture and anarchist ideas are hard to ignore. For one thing, Yiddish anarchists didn’t come from a Yiddish land with borders or state powers. There were certain ideas that Jews didn’t have to unlearn in order to transition into anarchist thought. Are there other factors that you think contributed to the attraction of so many Yiddish speaking Jews to anarchism? Kenyon Zimmer: Well, it’s important to remember that Italy didn’t exist until 1861. Most Italians didn’t identify strongly with the Italian nation state until well into the 20th century. It’s therefore no accident that there were a lot of Italian anarchists as well. Which is just to say, I think there’s a reason that both Jews and Italians found a lot about anarchism that was easy for them to understand. As you say, Jewish anarchists didn’t have to unlearn nationalism, especially because Zionism in places like the United States was not particularly strong until after World War I. In some ways, it was Jewish nationalism that was the new upstart, which had to contend with anarchism and other already existing political currents. In an interview late in his life, Ahrne Thorne, the last editor of the Yiddish paper the Fraye Arbeter Shtime said, simply, “Yiddish is my homeland.” Which I think nicely sums up a lot about it. CE: Anarchism has had different incarnations in so many different cultures and parts of the world. Did Yiddish anarchism develop distinct practices or emphasize particular ideas compared to anarchist cultures among other ethnic communities? In other words, was Yiddish anarchism just anarchism, translated into Yiddish? Or did Yiddish speakers practice and create their own kind of anarchism? Anna Elena Torres: Some people might assume that because anarchists believe in the abolition of borders, they also believe in the abolition of difference. But to the contrary, I think the particularities of Yiddish anarchist culture—like writing in a minor language or reinventing religious texts—show the importance of maintaining difference against cultural hegemony. I don’t think writing in Yiddish made them some sort of failed universalists; rather, writing from a non-territorial language became a position of critique. Yiddish remained in proximity to other languages: there are lively accounts of meetings in New York and New Jersey held in Italian, German, and Yiddish, all those languages in the same room together. In some anarchist spaces, Yiddish was one diasporic language among several. These social practices were crucial for cultivating comradeship; they sought to build liberated forms of kinship as the basis of society, not as a means to other ends, like the utilitarian comradeship of a military unit. The anarchists were trying to develop an everyday practice of comradeship, an anarchist minhag. This included building radical schools, art studios, cultures of song, children’s plays, picnics, steam boat fundraisers up the Hudson, intellectual salons. They sought to transform society through Yiddish radical culture, by articulating expansive visions of beauty in everyday life. Looking at these specific cultural forms might also connect Yiddish anarchism with recent thought on decolonizing anarchism, which critiques more “universalizing” aspects of European anarchism, as in the brilliant work of Macarena Gómez-Barris and J. Kehaulani Kauanui. Yiddish anarchism was invented by refugees who theorized from their experience of border crossing—how does that history relate to anticolonial anarchisms and indigenous critiques of the state? I think both share a consciousness of deep time and life before the rise of a nation-state; this remembering has the potential to destabilize the present moment, reminding us that there’s nothing truly inevitable about militarism and nationalism. Though there are different orientations towards land and territory between these movements, I am interested in a vision of anarchism that’s more than just radical cosmopolitanism, that’s really about producing solidarities in the present. Taking seriously the particularities of Yiddish anarchist culture could be a move towards also considering the particularities of Indigenous and First Nations and Maroon and PoC movements and their ongoing relationships to the state, rather than subsuming all of these into a flatly universalist idea of what freedom means or what it means to become ungovernable. KZ: It’s definitely not just anarchism translated into Yiddish. Yiddish anarchism, at least as it existed in the United States and elsewhere outside of Russia, was different from most other parallel or overlapping anarchist movements. It focused a lot more on Haskalah-type enlightenment, bringing great works of literature and science and philosophy to a Yiddish-reading audience. Yiddish anarchists translated an almost unbelievable amount of what you would call “world literature” for their readers. Their newspapers were chock full of it: Kropotkin, Herbert Spencer, Darwin, European playwrights and whatnot. I think Anna’s absolutely right. There was a focus on not universalizing, but on cultivating difference. It’s a worldview in which linguistic, cultural, and racial difference is viewed as a positive good. Yiddish anarchists very much focused on Yiddish cultural production and the Yiddish language as an important yet evolving project. They were also not traditionalists in any sense. They were not about observing or maintaining Jewish tradition just because it was tradition. They were very much about questioning and altering and innovating, but within a very specifically Yiddish and Jewish context. Tony Michels: I agree; I’ll only add that it did take anarchists in America some number of years to evolve to the outlook that Kenyon just described. The big turning point was the Kishinev pogrom in 1903. That was shocking to anarchists who had stressed universalism and who did not invest importance in Jewishness for the most part. After Kishinev, there was a pretty intensive reassessment of universalism (they used the word “internationalism”). It was at that point that a good number of the pioneers of anarchism in America started to think about the importance of the specificity of Jewishness, and even work towards a synthesis of Jewish nationalism and anarchism. That’s something admirable in anarchists, that they looked at the world around them and saw that ideas needed to be reassessed, and then struggled seriously with them. They worked hard to keep this universalistic impulse alive and also deal with the specific plight of Jews that demanded attention, and couldn’t be subsumed or ignored. CE: What kinds of influences have you seen religious Jewish culture and the atheistic culture of anarchist freethinkers having on each other? In your research, have you tended to see Yiddish anarchist thinkers and artists renouncing religious culture, or is there more of a cultural interplay than that? AET: There’s an intriguing figure named Rabbi Dr. Yankev-Meyer Zalkind. He was called der go’en anarkhist, the anarchist sage. He had a deep education at the Volozhin yeshiva, where his chevrusa was the poet Hayyim Bialik. Then he moved to London and became a radical anti-militarist, surveilled by Scotland Yard; the police records describe how Jewish mutual aid groups were organizing against the war. 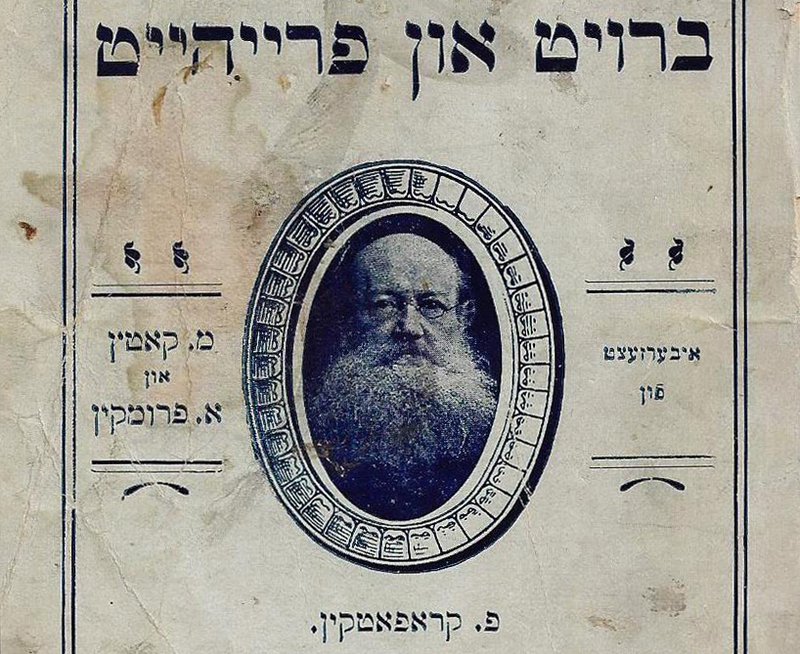 Zalkind published a few tractates from the Talmud in Yiddish in the 1920s and continued translating it for years, preparing an accessible version for workers. He remained an orthodox rabbi and a fiery anarchist throughout his life. He wanted to create an anarchist society in mandate Palestine, to overthrow the British and cultivate the land, to build Haifa into a refugium, in Agamben’s term—a space of refuge for the world’s refugees. I think looking at Zalkind’s life can tell us a lot about these convergences of religiosity and anarchism. From ads in Yiddish newspapers, we know he gave public lectures framing the Talmud as a proto-anarchist ethical tradition with no state power behind it. He definitely represents a strain of Yiddish anarchism rooted in textual tradition, in defiance of antisemitism and Christian hegemony. CE: It seems like there’s always been an interesting paradox in how people outside of the anarchist movement respond to anarchists. On the one hand, actual anarchist ideas, models, and tactics have been adopted far and wide; they are so dispersed in radical movements and even in progressive business models that most people never realize that these everyday practices grew out of anarchism. At the same time, associating oneself openly with anarchism is like asking not to be taken seriously. Why is that? TM: I think there are two reasons. One—and I’m summarizing a viewpoint—is that anarchism just can’t address the complexity of modern society. That it’s hopelessly impractical. I think the other actually has to do with a view of anarchism that comes from Marxism and Leninism, that anarchism is counter-revolutionary because it’s incapable of developing a political form to overthrow the bourgeoisie and establish a proletarian dictatorship. In that view, anarchism’s not just impractical but harmful, because it leads people astray. When they should be fighting for revolution, they fight for something else that can never happen. KZ: I would add, in terms of Jewish scholarship on the Jewish labor movement and Jewish left, the contributions and activities of Jewish anarchists have been reduced to a colorful episode that revolves around Yom Kippur Balls and that sort of controversy, and then the anarchists inevitably recede in the face of the rise of the Jewish Daily Forward and a more Americanized Jewish social democratic tradition. And that has erased some major contributions to things like Jewish garment unions in the United States. The fact that the International Ladies Garment Workers Union had an anarchist president for most of the 1920s has been disappeared or glossed over to the point that even to someone with a fairly good familiarity with the history of the Jewish labor movement, it would seem like an impossibility. CE: Why is World War II used to mark an endpoint for the Yiddish anarchist movement? What makes that a key moment? KZ: Part of it is the fact that half of the world’s Yiddish speakers perished in the Holocaust. But part of it is that it falls right on the heels of the end of the Spanish Civil War, which had for a brief couple of years really revived anarchism worldwide. In the case of Yiddish anarchists in the United States, the circulation of the Fraye Arbeter Shtime doubled during the Spanish Civil War because of this revived interest and hope. That, of course, came crashing down by the end of 1939. And then you have the foundation of the State of Israel which creates all sorts of contradictions and mixed emotions among a lot of longtime anarchists, who in many cases saw no alternative for Jewish survival as much as they were anti-statist, and hoped that somehow this experiment might move in that direction, that the kibbutzim in particular might help steer this new Jewish territory in a non-statist direction. Of course, that did not ultimately happen. TM: I’m not sure I see WWII as a turning point, myself. Already in the ’20s and ’30s, the anarchist movement was active, certainly among Jews, but the numbers were small for a host of reasons having to do with the Marxian left being much larger and more attractive . . . I think Israel actually has very little to do with the demise of anarchism. Anarchism by 1948 was tiny and existed mainly among earlier waves of immigrants. There were a few exceptions, there were people like Noam Chomsky, who was both a Zionist and an anarchist in this period. As Kenyon said, there was a stream in anarchism by then that said there’s a way to synthesize Jewish nationalism and anti-statism, and the kibbutz was that symbol for many. The kibbutz offered a way of building cooperative self-autonomous organizations that could lead to socialism, and that was appealing to some anarchists. And then the destruction of European Jewry and Jews elsewhere also confirmed what socialists—not just anarchists, but Marxists of all kinds—were saying, which is that Jews needed a homeland. All of this is to say anarchism was caught up in big social processes that were not of their making. I don’t know if World War II is in fact a turning point, but rather yet another signpost along a hard journey. AET: We can also look to points of transmission or continuity; some intergenerational kinships were formed through the Jewish anarchist movement after World War II. Chomsky, as a young person, hung out at the Fraye Arbeter Shtime offices in New York City. CE: One of the reasons I ask this question is because when I was a wee one in the ’90s, I met many, many anarchists who were around in the ’20s and ’30s and it did not seem at all to me like anarchism was small or weak. When I would hear their stories, it just seemed like that was absolutely a glorious heyday and of course they were looking at it with their own views of their youth. But the reason I bring it up is because the ideas that came out of the experiences that they had were transmitted very clearly and directly into the movements that I was around 60, 70 years later. And so I never would’ve thought when I was involved in those circles that there was this period in the mid-century where it just all came to a close. KZ: No, there’s absolutely continuity, and Andy Cornell’s book Unruly Equality does a really good job of tracing that continuity through the 20th century, but I think the crucial transition that already begins in the 1930s is that it’s no longer Yiddish anarchism. It’s English language anarchist organizing and publications and groups, which include a number of first or second generation Jews who may or may not have spoken Yiddish, but who, for all sorts of reasons, both by choice and by circumstance, needed to turn to inter-ethnic English language organizing and groups. But in doing so, a lot of what the previous generations of Yiddish anarchists had spent enormous amounts of time and effort building up in this Yiddish radical cultural sphere had to be left behind. Claire Ehrlich is an amateur Yiddishist and a longtime observer of anarchist movements. Tony Michels is the George L. Mosse Professor of American Jewish history at University of Wisconsin-Madison. Anna Elena Torres is an Assistant Professor of Comparative Literature at the University of Chicago. Her book Any Minute Now the World Streams Over Its Border! : Anarchism and Yiddish Literature is forthcoming with Yale University Press. Kenyon Zimmer is an Associate Professor of History at the University of Texas at Arlington, and the author of Immigrants against the State: Yiddish and Italian Anarchism in America (University of Illinois, 2015).